These simple Spinach and Artichoke Wonton Bites are a perfect appetizer or snack to serve at any party or get-together. 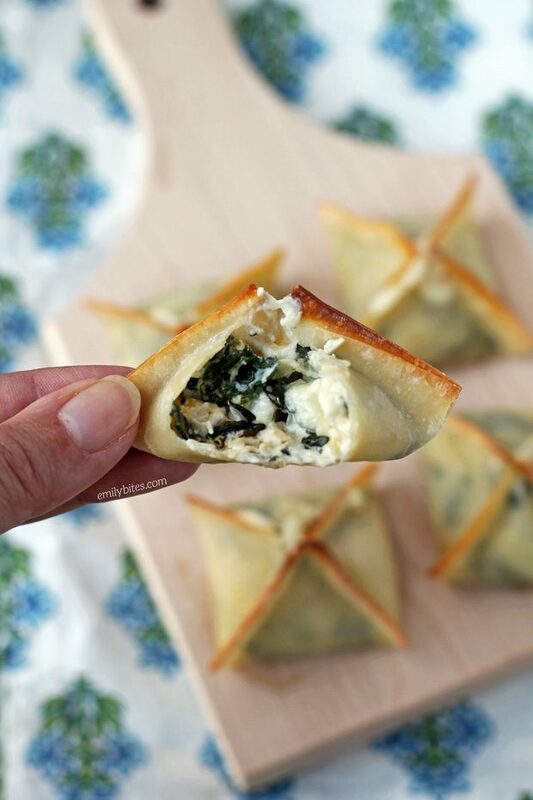 Hot, cheesy pockets of gooey spinach and artichoke dip wrapped in crispy wonton wrappers are sure to be a crowd-pleaser. Plus, this recipe is super easy to put together and each of these Spinach Artichoke Wonton Bites is just 44 calories or 1 Weight Watchers Freestyle SmartPoints. That’s right, just ONE SP each! Y’all know I love wonton wrappers. Looking for more ways to use them? I’ve got you covered! Check out my recipes for Chili Wonton Cupcakes, Asian Chicken Wonton Cupcakes, Caprese Wonton Bites, Pizza Wonton Cups, Chicken Bacon Ranch Wonton Cupcakes, Mixed Berry Mini Tarts, Reuben Wonton Cupcakes, Chicken Parmesan Wonton Cupcakes, Mini Cinnamon Apple Tarts, Taco Cupcakes, French Dip Cupcakes, Berries and Cream Cinnamon Dessert Cups, Buffalo Chicken Cupcakes, Cheeseburger Cupcakes, Lasagna Cupcakes and many more! Lightly mist a large skillet with cooking spray and bring to medium heat. Add the spinach and cook for a couple minutes, stirring occasionally, until the spinach is wilted, Add the minced garlic and cook for an additional 30 seconds until garlic is fragrant. Transfer the spinach and garlic to a mixing bowl and add the cream cheese, sour cream, Mozzarella, artichoke hearts, parmesan, pepper and red pepper flakes. Stir until well combined. Fill a small dish with water and set it beside you on a clean, dry work surface (like a cutting mat). Lay a wonton wrapper on the mat. 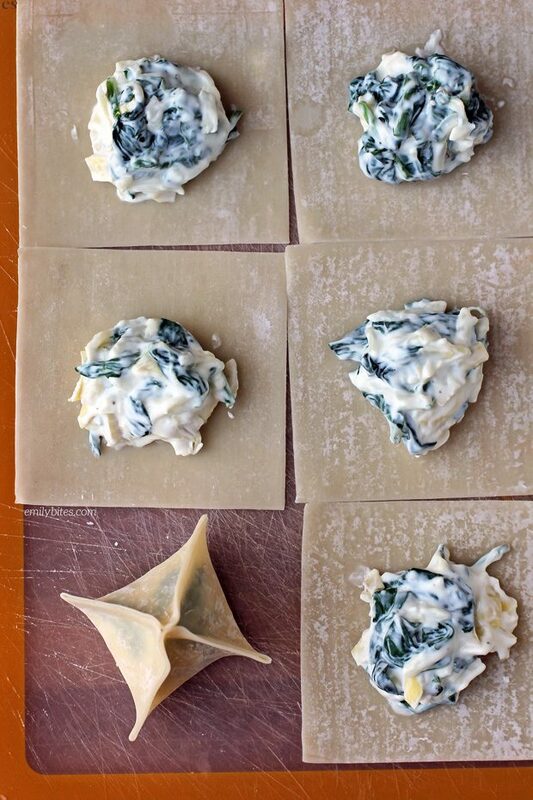 Scoop a tablespoon of the spinach artichoke mixture into the center of the wonton wrapper. Dip your finger into the dish of water and run it along the entire outside edge of the wonton wrapper, corner to corner, creating a square of wet around the edge of the wrapper. Gather the four corners of the wrapper and bring them to the center, pressing them together. Use your fingers to press together all the edges of the wonton wrapper to seal the wonton bite closed. Place the finished bite onto the prepared baking sheet from step 1. Repeat with remaining ingredients to create 20 wonton bites. Mist the tops of the bites with cooking spray. Place into the oven and bake for 10-12 minutes until the X at the top of the wonton bites are golden. Serve warm. What I love the most is how different these are. They seem like such a perfect appetizer and they’re something that most people wouldn’t expect at all. Wondering if these would be even crispier cooked in an air fryer? Yum! I don’t own an air fryer so I can’t say for sure but you can certainly try it! Can you prepare these ahead and then bake when ready to serve? Fabulous appetizer… had a baby shower at my house and made 75 of these little guys. The ladies loved them I just wanted to say I have lost 62 pounds cooking your great recipes. Thank you. I’m so happy these were a hit, Traci and CONGRATS!! You’re amazing.